The FTD® Stunning Beauty™ Bouquet is an eye-catching collection of beautiful blossoms – perfect for celebrating life’s special occasions. 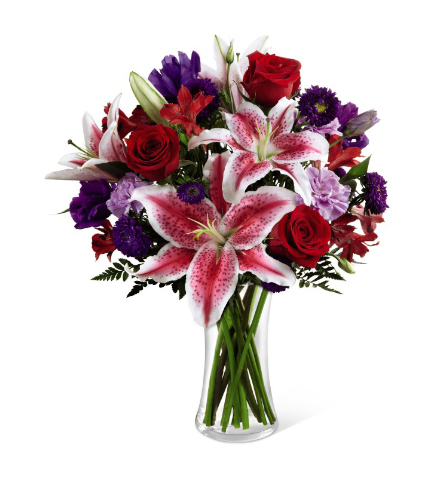 Vibrant red roses and alstroemeria (Peruvian lilies) adorn this arrangement along with lavender carnations, purple double lisianthus, matsumoto asters and stunning stargazer lilies. Each flower is hand-picked by our floral experts and arranged in a contoured glass vase. Delivered fresh, this stunning floral gift is ideal for ladies of any age for a birthday, anniversary, congratulations, Valentine's Day or Mother's Day gift.